When Oakdale began in the 1680s, it was a woodland wilderness. Following the American Revolution, farmers cleared and worked the land. "Oyster King" Jacob Ockers and his men followed, working the bay. The railroad ushered in wealthy sportsmen to the South Side Sportsmen's Club. Some of these men, like William K. Vanderbilt and William Bayard Cutting, stayed and built palaces for their families. The scene changed starting in the 1920s, bringing flappers, artists, bootleggers, and Broncho Charlie, the last living Pony Express rider. The former mansions of the well-to-do now served as homes to a military academy and a religious cult, while still retaining their turn-of-the-century style. Chris Kretz and Diane Holliday are faculty members at Dowling College in Oakdale. Kretz is the digital resources librarian, and Holliday is the archivist and creator of the Long Island South Shore History Wiki. 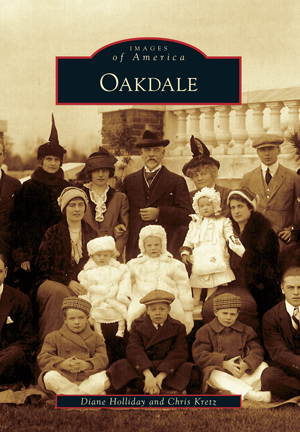 The photographs in Oakdale have been culled from the Dowling College Library Archives and Special Collections. Others were generously loaned by historical societies and local residents. All of the authors' proceeds from book sales will go towards the creation of the Long Island South Shore History Center.